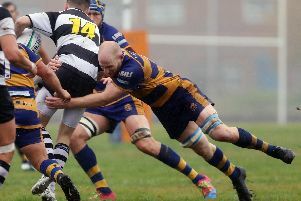 WILL KNIGHT has told Havant to build on their performance against Sevenoaks when they travel to Westcombe Park in London one south on Saturday. The Hooks Lane side suffered a last-gasp 36-35 defeat last weekend. Nevertheless, Knight felt there was little wrong with his side’s display last time out. The senior coach is looking for Havant to maintain the same intensity as they bid to climb away from the relegation dog fight. ‘We should have won against Sevenoaks and I am looking for us to build on that,' said Knight. ‘The players set themselves a bar of what to expect from each other. Now they must not let their levels fall below that. ‘If we can reproduce the same kind of performance then we will be very competitive. ‘As a team we are seeing the newer players bedding in well. When players return they’ll slot into a settled squad. ‘We have a significant number of home games coming up between now and the end of February. Meanwhile, United Services are keen to keep the pressure on the top two in London three south when they entertain Old Georgians at Burnaby Road. Rich Neil regards the next few of weeks as vital. ‘The next three games are really big for us,’ said the player-coach. ‘In recent games we haven't quite reached our best levels. 'We have been winning but making hard work of it. ‘It is crucial that we get back to where we want to be. Fly-half Owen Herbert is ruled out with a knee injury, with Sam Mullane set to take his place. On the back of a maiden London three south west win, Petersfield travel to Teddington in good spirits. Southsea Nomads are eyeing a top-three spot in Hampshire two when they host Overton II.